BC Tourism Awards Nominations are Open! 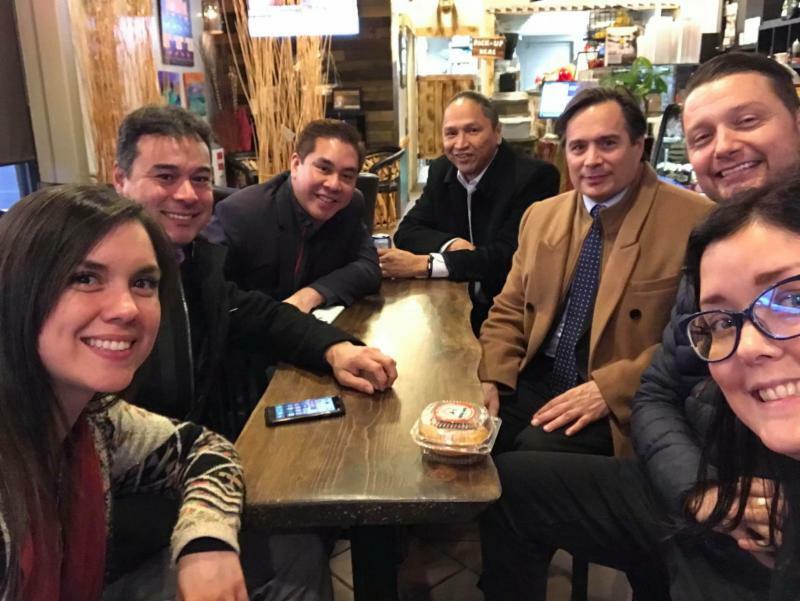 Indigenous Tourism BC, Indigenous Tourism Association of Canada and the Thompson Okanagan Tourism Association met recently at West Kelowna's Kekuli Cafe to begin planning the 8th annual International Indigenous Conference. The event will be hosted on the traditional territory of the Syilx peoples with partners from the Nlaka'pamux and Secwepemec nations in November 2019. Remember your high school days when the teacher served 24 hours notice of an exam the next morning that meant cramming all night to learn the subject matter? At TIABC, we sometimes find ourselves in a similar situation when a complex issue surfaces that we haven’t yet mastered. In fact, for the better part of two months, TIABC’s team has been learning about the complexities around the welfare of the Southern Resident Killer Whales (SRKWs), and how to protect them from declining in numbers. Without going into great detail, Pods J, K and L typically ply the waters of Juan de Fuca Strait (part of the Salish Sea) on both sides of the border from May to November, consuming Chinook as their primary source of food. With images of a mother SRKW pushing its dead calf for 17 days viewed by millions around the globe a couple of months ago, the plight of these animals has garnered increased national and international attention, particularly in Ottawa. Consequently, yesterday the federal government introduced additional measures to protect SRKWs including an expanded critical habitat zone. As we study the 84-page report, it is clear that while these actions are still open to interpretation, marine-based tourism activities such as recreational fishing, whale watching and diving off the southwest coast of Vancouver Island could be in serious jeopardy. 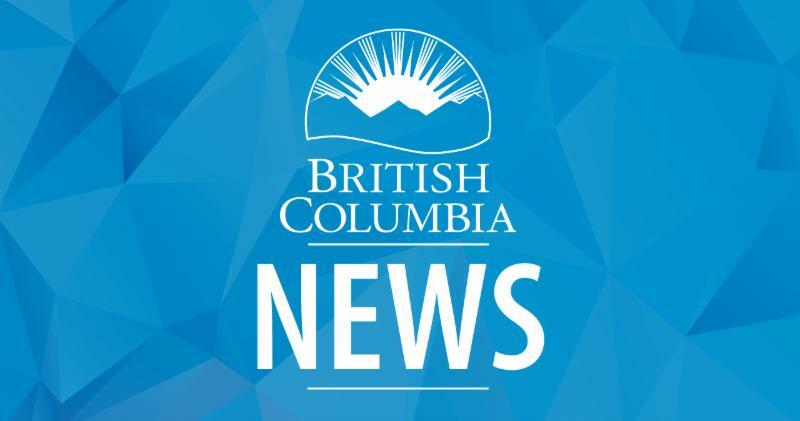 This morning in Esquimalt, our partners at the BC Chamber of Commerce, who we’ve been working closely with on this issue for several weeks, hosted a news conference in conjunction with 18 island chambers to send a clear message to decision-makers. The collective chambers, along with supporters including TIABC, our member whale-watching companies, the sport fishing community, and DMOs stressed that everyone has a vested interest in a healthy whale population of all species. Under the guise of a newly formed coalition called Healthy Orcas, Healthy Communities, the chambers outlined several options to ensure SRKWs, their northern cousins and other transient whales continue to thrive in BC waters. Aside from the desire to work closely with the Department of Fisheries and Oceans on a range of science-based solutions, the chambers did not mince words about arbitrary decisions that would essentially destroy tourism and related business sectors in small communities up and down the southwest coast of Vancouver Island. If marine-based tourism is effectively shut down within a critical habitat zone, so too are conservation and education programs, as well as research and additional investments that whale watching companies, the sport fishery and other marine sectors put into protecting and sustaining the SRKWs and food sources for all species. The issues are complex, the stakes are high, and one or more stakeholders will be issued a failing grade when all is said and done. For TIABC, we’ll continue to pull an all-nighter to study this file with tutoring by sector partners, the BC Chamber of Commerce, as well as subject matter experts so that we can confidently speak to government in the context of Healthy Orcas, Healthy Communities. The BC Tourism Industry Awards recognize tourism industry organizations, businesses and individuals who have made exceptional contributions to the province's tourism industry. Recipients provide outstanding service, exemplify best business practices, innovative marketing and deliver tourism experiences that contribute to the overwhelming success of BC's tourism industry. 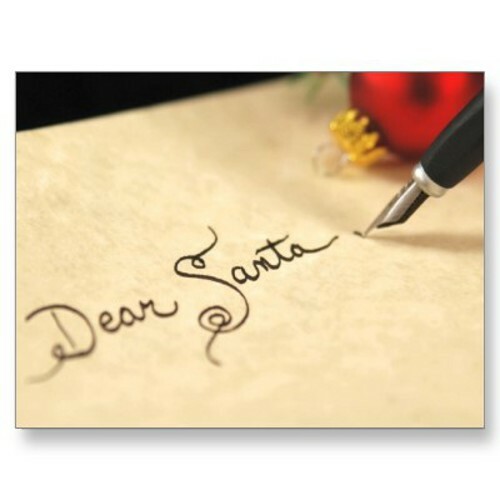 There are several things that TIABC is hoping to receive this Christmas. Two of these items are ones you can help with. 1. 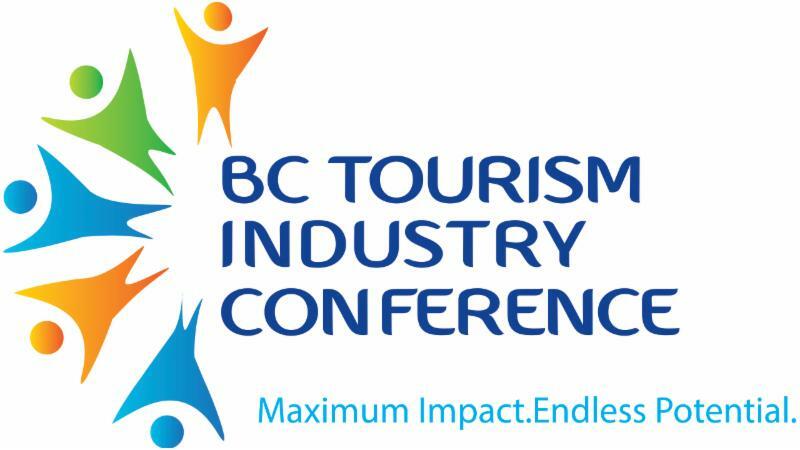 TIABC is seeking sponsors for the 2019 BC Tourism Industry Conference Adopt-a-Student program. 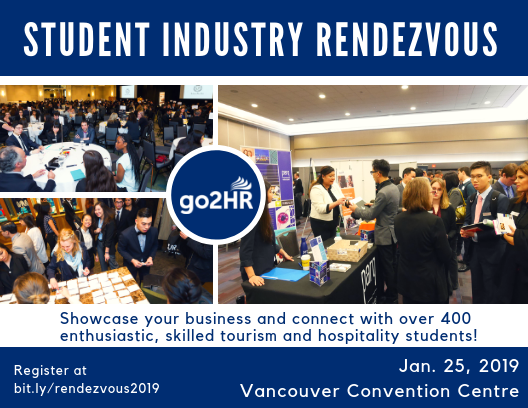 A few hundred dollars can enable a full-time student in BC to experience the conference and meet potential future employers. 2. 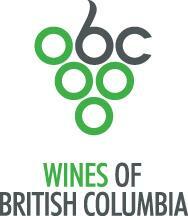 Experiences, services and good for the BC Tourism Industry Conference silent auction. Visit our conference website for auction ideas. 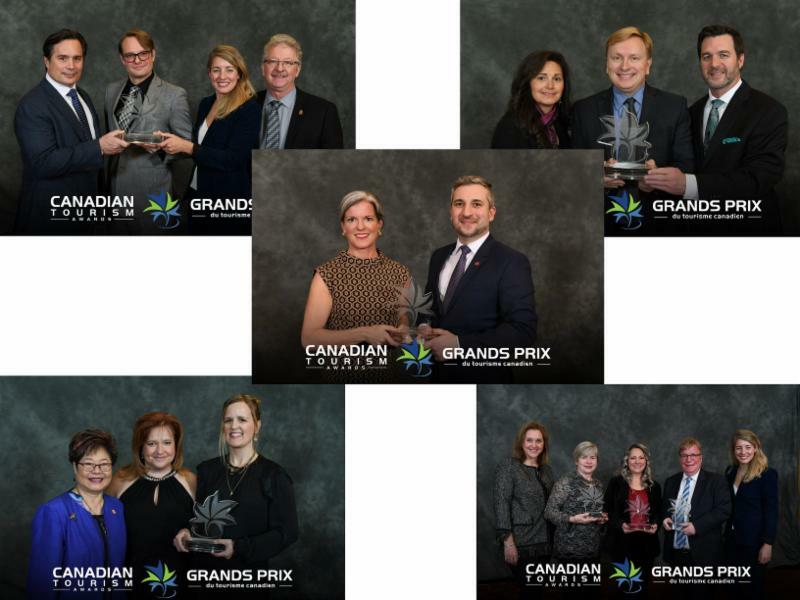 The Canadian Tourism Awards were presented during last week's TIAC conference to recognize success, leadership and innovation in Canada's tourism industry, and to reward those people, places, organizations and events that have gone above and beyond to offer travellers superior tourism experiences in Canada. BC companies/organizations were well represented as nominees and winners. On November 23, Maya Lange, VP of Marketing for Destination British Columbia, accepted the Canadian Marketing Association's “Marketer of the Year” award. 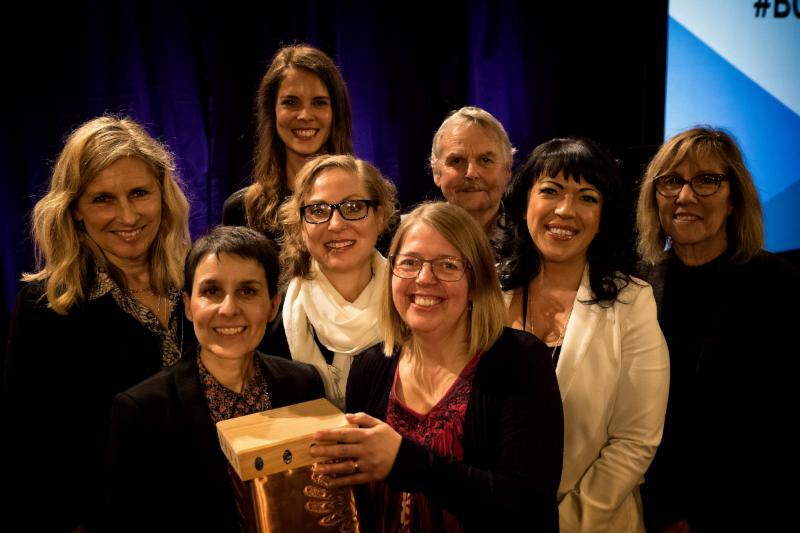 The award – one of several that pay homage to the organization’s multiple-year journey from destination marketing organization to industry-leading marketing powerhouse – arrives at the close of BC’s most successful tourism year to date, supporting the rising importance of tourism to the BC economy. At the recent TIAC Congress, the newest signatories, including TIABC, showed their support for the initiative. Increase the average percentage of women on boards and women in executive positions in corporate Canada to 30% or greater by 2022. Share key metrics with Catalyst for annual benchmarking of our collective progress. 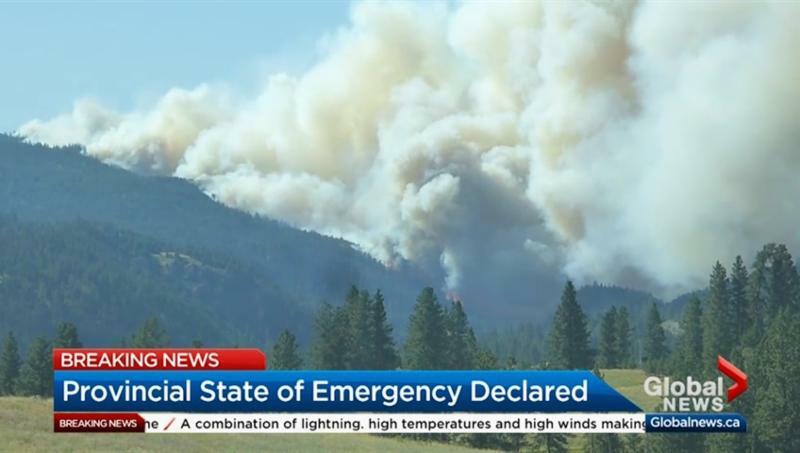 Destination British Columbia is interested to learn the collective impact the wildfires and floods have had on tourism businesses in the past two years. All tourism businesses are invited to share their experience, regardless of the level of impact (if at all) on their business. Your input is vital to the success of this study. The information you share will be used in aggregate to assess the viability of proceeding with a provincial-wide economic impact study to ensure provincial representation across different business types. As such, this survey will ask you to assess business impacts on employment, revenue and occupancy, using percentages, for both 2017 and 2018. The Premier’s Wild Salmon Advisory Council is continuing its work toward the development of a renewed provincial approach to protecting and enhancing wild salmon, with the launch of community engagement sessions around the province. 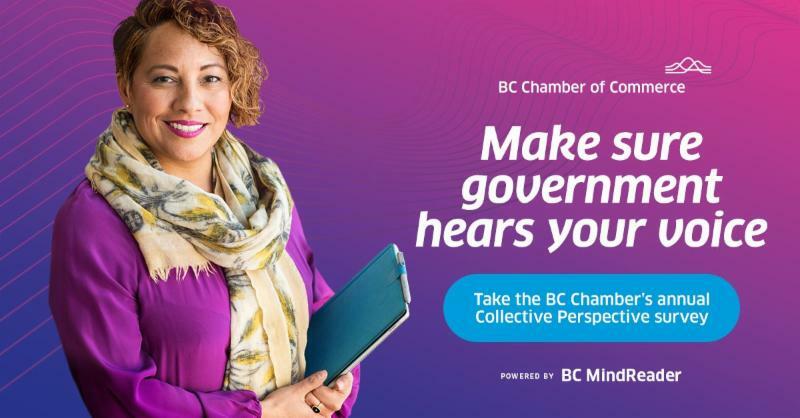 The BC Chamber of Commerce released the results of its Collective Perspectives survey and there were a few surprises. The outlook for the next three to five years was favourable with 95% answering positively and just one% responding that the prospects for their business are very poor. Not everything is rosy in BC, however. The affordability of housing was the top concern among members, as were federal taxes, provincial taxes, access to labour and cost of labour. 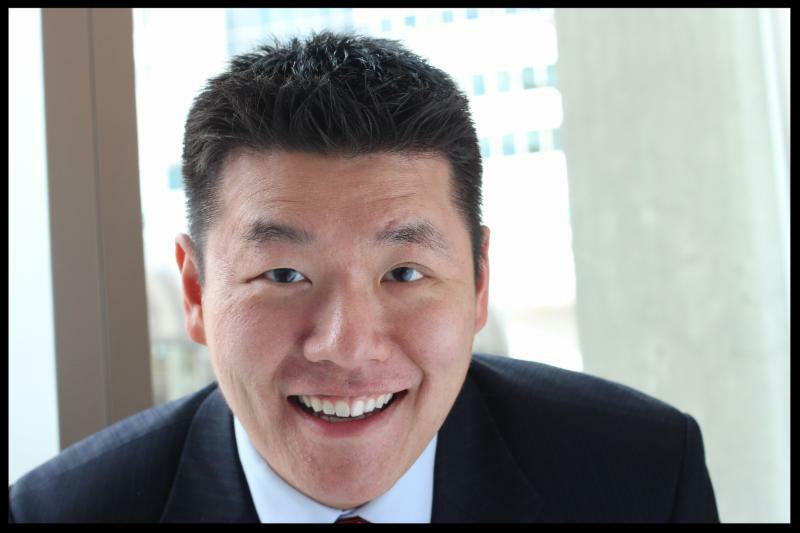 The Government of Canada has introduced Bill C-81, the Accessible Canada Act: An Act to Ensure a Barrier-free Canada . If passed, Bill C-81 would benefit all Canadians, especially those with disabilities, by helping create a barrier-free Canada. The Honourable Carla Qualtrough, Minister of Public Services and Procurement and Accessibility, along with the ministers of Justice, Foreign Affairs and Canadian Heritage, recently announced that, with the support of all provinces and territories, Canada has acceded to the Optional Protocol to the United Nations Convention on the Rights of Persons with Disabilities. Along with the proposed Accessible Canada Act, which was recently adopted by the House of Commons and is now before the Senate, this announcement shows that the Government of Canada is taking another step towards creating a barrier-free Canada. The agreement will see Airbnb leverage its global reach through digital channels such as Instagram, Facebook and Twitter, as well as its magazine Airbnbmag, to boost Vancouver's reputation as a premier destination. 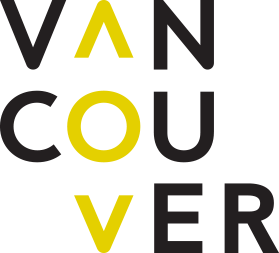 Additionally, Airbnb will work with Tourism Vancouver to expand the variety and quality of licensed accommodation offerings in the city, providing visitors with diverse options to suit every budget and style. The BC government has released CleanBC - a pathway to a more prosperous, balanced and sustainable future. It builds on recent announcements, such as mandating 100% of new cars to be zero-emission vehicles by 2040; providing rebates for efficiency upgrades including insulation and heat pumps; signing a memorandum of understanding with business on a low-carbon economy; and intervening in court to support carbon pricing across Canada. 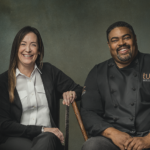 The BC Hospitality Foundation (BCHF) is delighted to announce that it is once again the chosen charity for Dine Out Vancouver Festival ’s Grand Tasting. The launch event will be held the night before the festival begins on Thursday January 17th at Rocky Mountaineer Station, and will feature culinary bites from some of the city’s top restaurants paired with samples from 20 BC wineries, as well as local craft breweries and cideries. $89 Early Bird tickets are available until midnight on December 24 th. After this date the price increases to $99 per person. All world regions enjoyed robust growth in international tourism in the first nine months of this year, fuelled by solid demand from major source markets. 2018 results to date are in line with the UNWTO's growth forecast of +4% to +5% for the year. 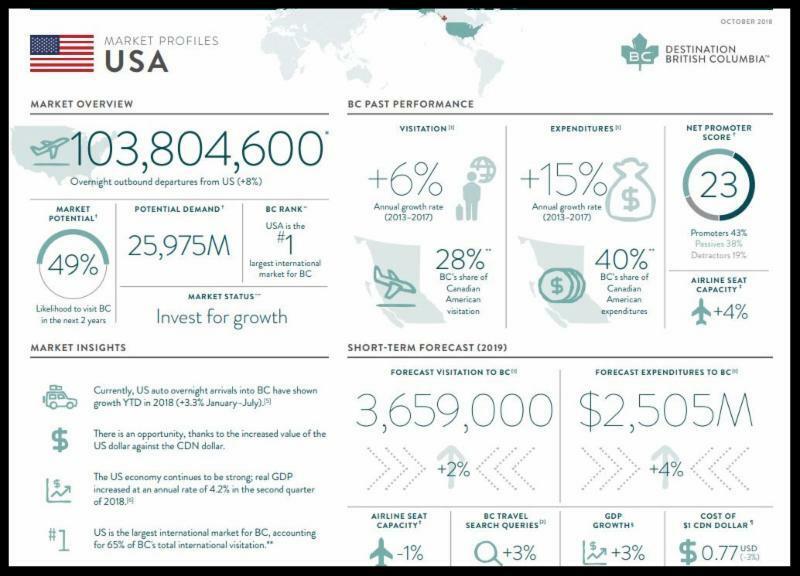 Want to learn more about Destination BC’s key geographic markets? The recently published market profiles provide a market overview (including outbound travel, market potential and market status), BC past performance (volume and expenditure growth rates), market insights, a short term forecast, and trip characteristics. Prince of Whales Whale Watching has launched a $1-million, multi-year investment strategy aimed at supporting the southern resident killer whale population through salmon enhancement, marine conservation and investing in scientific research. Tourism Richmond and the Richmond Hotel Association will collaborate to bring Canada’s West Marketplace (CWM) to the city in 2019. Established in 1989, the three-day, four-night business conference showcases western Canada tourism products to international and domestic tour operators and buyers. The Port of Vancouver is bringing locals together to talk about how they’re helping tourists experience the best of Vancouver, and are ensuring the region benefits from the extra business they bring. Videos and stories feature cruise ships, restaurants, coffee shops, craft brewers, conservationists and more. Tourism Kelowna is proud to announce that it has successfully achieved Destination Marketing Accreditation Program (DMAP) recertification. Administered by Destinations International , DMAP certification is globally recognized, like ISO Certification but specific to destination marketing and management. 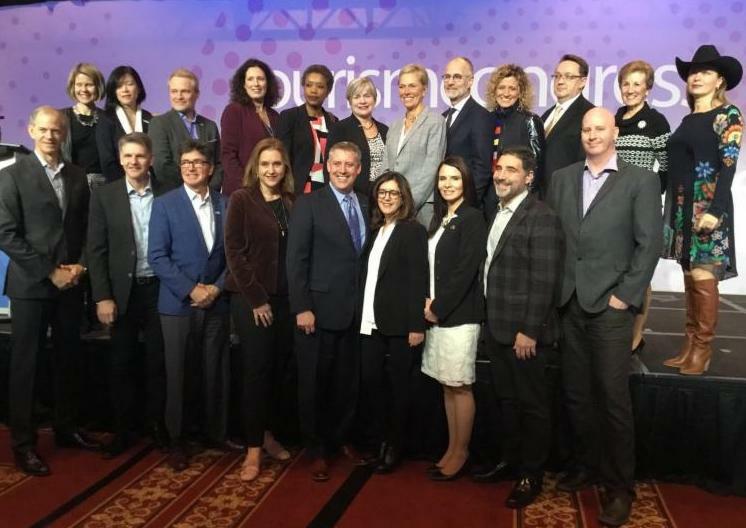 The federal government has created an advisory council on tourism in a bid to bolster the economic potential of Canada’s tourism industry. Providing BC wine industry input to the Council, the BCWI recently participated in an industry round-table discussion highlighting the economic impact of our industry and the opportunity to accelerate inbound tourism growth and build on BCWI's efforts and success to date. The project involves an extension at the Ogden Point port in Victoria to accommodate larger vessels. 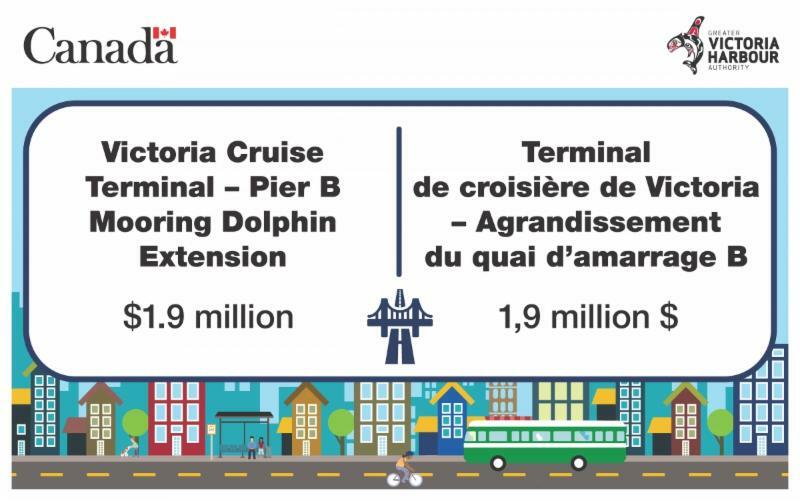 The new structure will be able to dock quantum-sized cruise ships that are increasingly being used by cruise lines, allowing this popular hub on Vancouver Island to accommodate more passengers while supporting tourism and economic growth for the region as a whole. Statistics Canada has been helping businesses by raising awareness of the importance and use of census data tools. A new video has been produced that provides information on the different ways that businesses in your community can use census data and shows how easy it is to do so. BC Ferries and the First Peoples' Cultural Council recently revelead the artistic designs for the Northern Sea Wolf. 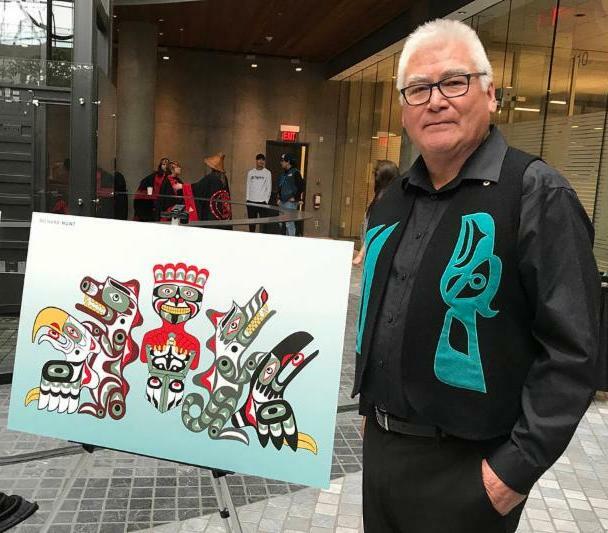 Kwakiutl First Nation's Richard Hunt and Nuxalk Nation's Danika Naccarella designed the artwork that will adorn the vessel. Hothouse Marketing is thrilled to announce that Debbie Chabot has joined their team as Media Director. 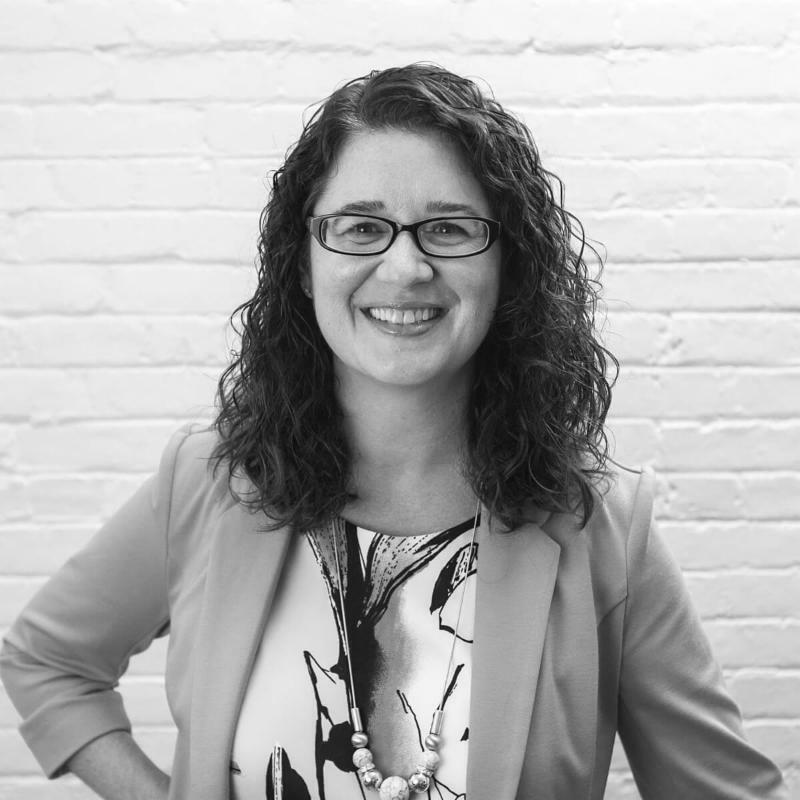 With over 15 years’ media experience, Debbie has worked on some of British Columbia and Alberta’s biggest brands, including BC Ferries, Bell Canada , Shaw , The Dairy Farmers of Western Canada, and Royal Roads University to name just a few. 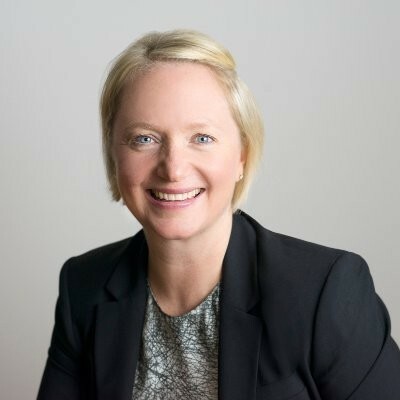 She brings a track record of innovation, media creativity and hard negotiation to Hothouse - a stellar addition to their award-winning media planning and buying team.